Down pillows that don't flatten out. Dimensions: 20" × 26", Weight: 24 oz. We make these wonderful down pillows in our factory in California. We use USA grown organic cotton fabric filled with ample amounts of 50/50 down filling. People really love these soft down pillows because they are so full. We can even make them with a custom firmness. 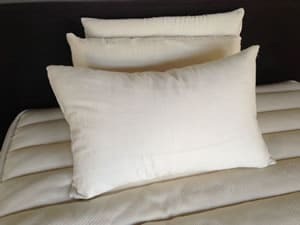 Contact us if you prefer a medium firm and overstuffed down pillow (we can add 15% extra filling) or an empty, understuffed down pillow (we can remove 15% of the fill). 12" × 12"14" × 14"16" × 16"18" × 18"20" × 20"22" × 22"24" × 24"26" × 26"28" × 28"30" × 30"
Down pillows are used to fill decorative fabric cases. Down is the only filling that allows the karate chopped look in the middle of a down pillow. Did you know? A Euro down pillow insert measures 26"×26". 5/95 is a blend of down (5%) and feathers (95%). 25/75 is a blend of down (25%) and feathers (75%). 50/50 is a blend of down (50%) and feathers (50%). Down pillow inserts with a blend of 25/75 or better are considered higher quality. They have a higher down content and thus are softer. Down pillow inserts are covered with a 220-thread count down proof fabric. This special type of fabric is made using a weaving pattern and thread size that prevents down leakage. For the best quality and softest down pillow insert order the 25/75 blend or a better one. If you scroll down to the customizable shapes below, there we offer our higher quality 50/50 blends. 50/50 blends make an even softer feeling down pillow. You should use 50/50 blends for high end jobs or when thin decorative fabric cases are being filled). Choose a down pillow size for a price quote, and you will also see our large selection of Sunbrella ® and other decorative fabric cases. Important Note: Order your down pillow insert 2 inches (5 cm) larger than the decorative case in order to fill it out properly. 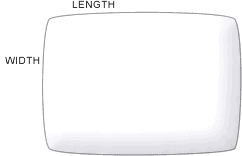 For example, if your decorative case size is 20" × 20", order a 22" × 22" down pillow insert. If you are filling a really light fabric case (like silk) then order the exact size. Also order the exact size if your case size is less than 16 inches (41 cm)—for instance, to fill a 14" × 14" case, order a 14" down stuffer. Finally: pillows are measured empty, lying flat, without any filling. When filled, their outer edge contracts, so their size shrinks. Give us a call if you want us to provide a measurement of any of our squares when they are filled. Perfect for filling odd size down pillows! We custom make these "knife-edge" down pillows to your dimensions. Enter dimensions in the boxes for a price quote and be sure to browse our fabric choices. Note: If either side of the decorative case is 16 inches (41 cm) or larger, be sure to add 1–2 inches (2.5–5.1 cm) to that side so that the down pillow will properly fill out the decorative case. Get great neck and lower back support with a custom bolster shaped down pillow, designed to your measurements, with your choice of filling! Choose from polyester, soft grey duck down filling, or premium white goose down. Enter dimensions for a price quote, and then browse through our large selection of fabrics. Length must be between 1 and 120 inches (2.5 to 304.8 cm). Diameter must be between 4 and 120 inches (10.2 to 304.8 cm). Note: If filling your own case, order this down pillow insert 1 inch (2.5 cm) longer (in length) than the case in order to fill it out properly. This cool looking spherical down pillow is like a beach ball for your couch or bed. Choose from polyester, soft grey duck down, or premium white goose down filling. Enter dimensions for a price quote, and then browse through our large selection of fabrics. 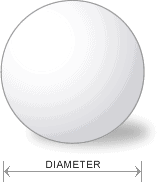 Diameter must be between 6–120 inches (15.2–304.8 cm). Order your ball 1 inch (2.5 cm) larger than the decorative case it's filling. 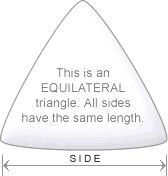 Order triangle down pillows 1 inch (2.5 cm) larger in both dimensions than the decorative case. If you are filling a really light fabric case (like silk) then order the exact size. 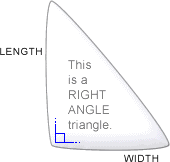 Also order the exact size if your case size is less than 16 inches (41 cm)—for instance, to fill a triangle case 12" × 15", order a triangle down pillow exactly 12" × 15". Pillows are measured empty, lying flat, without any filling. When filled, their outer edge contracts, so their size shrinks. We cannot guarantee our custom pillows will fill a specific dimension. If our staff offers advice on this, they are making their best guess, but we cannot guarantee the size. Down pillow insert making materials can be found on our pillow stuffing and lining pages. On these pages you will see many more types of 100% natural and synthetic filling to make your down pillows. Down pillows may be returned unused in new condition for a refund less a 15% restocking fee. Custom size pillows may not be returned. Don't forget to check our clearance section where you may find a discount down pillow.